endonitis of the wrist/hand is an overuse injury caused by repetitive microtrauma. Continuous micro ruptures of the collagen fibers leads to inflammation and pain. Golfers with bad mechanics are more susceptible to this injury. How can you prevent tendonitis of the wrist/hand? First by controlling your swing, by not letting your wrists break at the top of the swing. Second, make sure you have a firm grip on the club, weak grips make the muscles strain to keep the club in control. Treatment includes wearing a wrist brace and icing the injured area, as well as seeking professional chiropractic care for carpal bone injuries if severe enough. Upper Crossed Syndrome affects the posture and ability to rotate during a swing. This syndrome is caused by tight upper trapezius and levator scapulae muscles (upper back area) and lower pectoralis muscles (chest area), in combination with weak neck flexor muscles and lower trapezius muscles(middle back). This crossed imbalance cause a C-shaped posture of the back and hunched shoulders to occur when getting into the starting position for a swing. This position can limit the golfer's ability to rotate properly during a full swing. To prevent this condition the range of motion must be increased to eliminate the C-shaped posture of the spine. The spine can be adjusted to correct this as well as using exercises to balance the muscles. Left untreated not only will one's golf game suffer but back pain can become part of everyday life. Lower cross syndrome is a combination of weak glutes and abdominals and tight hip flexors and lower back extensor muscles. Again forming a cross imbalance affecting the posture of the golfer. This posture is known as S-shaped, over arching of the back occurs causing large amounts of stress on the lower back. Lower back pain will arise from this posture, however getting range of motion and strength back into the muscles will eliminate the pain. This over arching of the back can create extension malpositions of the spine that need to be adjusted by a chiropractic physician, and your Bozeman Chiropractor will be able to get you started on exercises as well to correct the imbalance and improve the golfer's posture. 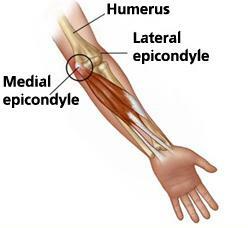 Golfers elbow or medial epicondylitis, is an overuse injury similar to tennis elbow (lateral epicondylitis). The repetitive stress causes small tears in the tendon leading to pain and weakness in the elbow joint. Pain is present in the inside of the elbow when gripping the club and weakness occurs when resisting wrist flexion and pronation. This type of condition requires chiropractic treatment until the tendon can heal. Rotator cuff injuries occur in golf because the shoulder joint is the body's most mobile joint and that causes instability. The rotator cuff muscles stabilize the head and upper arm and the power to swing the golf club. Injuries include tendinitis, bursitis, and/or impingement. Tendinitis is an affected tendon that has become inflamed and painful. Bursitis is when a bursa sac becomes irritated and swollen (bursa sac is a fluid filled sac typically located beneath a tendon). Impingement is when repetitive motion, like arms going above the head like in a golf swing causes tendons to rub together or tear by the friction from the elevated humeral head (ball of the ball-and-socket). Chiropractic with physical therapy is the best option of treatment to get the joint positioned correctly as well as strengthen and balance the shoulder stabilizers.